Happy Friday! Today is Evaluate Your Life Day. It's a day to pause and think about our lives and find things that we want to change for the better. Only through self examination can we strive to make improvements. Here's what's happening around the Colorado beerosphere today Friday, October 19th, 2012. Ouray Brewery (Ouray, CO) - Staring on this coming Monday, October 22nd, you can get half-price pints all day every Monday through the end of November. That's right - pints will only cost you $2 a pint all day every Monday for a limited time. Head to Ouray now before the winds of winter come sweeping in. Monday's just got a lot better. Pug Ryan's Steakhouse and Brewery (Dillon) - Need a good laugh? You're in luck. Tonight at Pug Ryan's they will be hosting a Live Comedy Show starting at 10:00pm. The show is hosted by Kevin Bennett and J-sin Novak. Head up to Dillon and laugh the night away while sipping on some great beer. Oktoberfests (Colorado) - Hadn't gotten your fill of Oktoberfests yet? There's still some left. Head to Littleton (courtyard of Jvation building) or Colorado Springs or to Carbondale Beer Works in Carbondale this weekend. It's your last chance to wear your lederhosen til next year. Arvada Beer Company (Arvada) - Want to learn to brew beer? Arvada Beer Co is offering classes with dates in November, December and January. For $25 you'll get not only a class but a pint of beer, plus you get to take home a six-pack of that beer when it's done. Advanced classes last about 8 hours, Beginner classes last 3 hours. Each class, they will be brewing up something different. Classes start at 9pm and end around 3pm. Nov. 18th (Russian Imperial Stout), Dec. 2nd (Christmas Ale), Dec. 16th (Barleywine), Jan. 13th (Alt beer), and Jan. 27th (American Lager). More details and sign-up on their website. Beer Thoughts: Did you get a look at the new Oskar Blues 19.2oz Dale's Pale Ale can that debuted last week? It's a tallboy and then some. It's going to be offered as a standalone can and won't be sold in a pack like their other beers. Consider this a bomber in a can. Dale's Pale Ale is already a big hoppy pale ale. It weighs in at 6.5% ABV, so it's no light weight. It's normally sold in 12oz cans. Now add to that another 7.2 ounces and you've got yourself a party in a can. It's as narrow as a 12oz can but a lot taller. Hope it's not too top heavy. Might need to build a base for it so it won't tip over.I just hope I can finish one can before it gets too warm. Love being able to buy just a single can when I want it. Enough to share with a friend too. What do you think of the new can size? CAUTION: Brewing Co (Denver) - Parking Lot Repave Take Two! The previous attempt at repaving their parking lot was cancelled so this Saturday, October 20th their entire lot will be closed off. But fear not! They will still be open. Just follow the yellow CAUTION tape to guide you to their taproom. Park along 39th Ave and walk over. High Hops Brewery (Windsor) - Today's the day! Their Grand Opening officially starts today at 12:00 noon. The live music will start at 4:30pm and last until closing. Food available courtesy of the Wing Shack and Chaulkoard Gourmet Express. The party continues on Saturday with even more fun and music. Stop in for a taste or two. Located at: 6461 Hwy 392 (west side of town on the main road) in Windsor, CO.
Yak & Yeti Brewpub (Arvada) - How do you make a tart quasi-sour beer without using funky bacteria (like Brett, Lacto or Pedio)? Yak & Yeti brewer Adam has been experimenting with acid malt and adding fruit (like blueberries) that have a natural tartness and came up with "Blueberry Tart", a beer inspired by the pie-like dessert. Adam wanted to keep his brewhouse free of the sour-inducing bacteria and came up with another way to give a beer a bit of pucker power. It's now on tap at Yak & Yeti. Grimm Brothers Brewhouse (Loveland) - Want to start your weekend a bit early today? Grimm is open at noon today and is offering $1 off pints until 3:00pm today. You can even grab some lunch from Chaulkboard Gourmet Express as well. Looking for some Halloween fun? 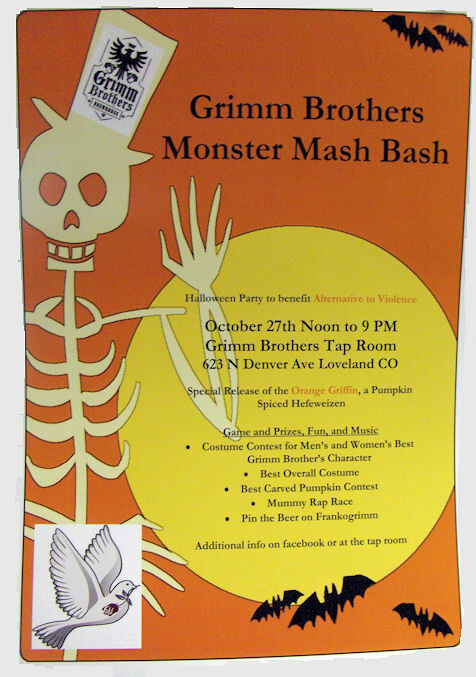 Come to the Grimm Brothers Monster Mash Bash on Saturday, October 27th from noon to 9pm at the taproom. There'll be a costume contest for the best Grimm Brother's story character and best overall costume, a Mummy Rap Race, Pin the beer on Frankogrimm, and a special release of Orange Griffin - a pumpkin spiced hefeweizen. Games, prizes and more! Trinity Brewing Co (Colorado Springs) - Merle Nocturnum Saison is back on draught today at 5:00 PM. This huge (12.5% ABV) "super saison" is spiced with a blend of sarsaparilla, sassafras, rosemary, coriander, hibiscus and cumin for a perfect balance of spiciness, sweetness, and acidity. Come try some. The Mayor of Old Town (Ft. Collins) - Do you know about The Mayor's Friday Afternoon Club? Stop in today between 3 and 5pm and receive free pizza as you enjoy a beer.